Grab a skillet, mix things up, and voila! A wonderful dish ready in less than 30 minutes with an added bonus of little to no clean up. This mushroom bacon skillet will let you serve up a keto-friendly meal that is packed with lots of great nutritional benefits. This recipe calls for a recommended mix of shiitake, cremini, and ali’i mushrooms, but let’s take a closer look at the third most widely distributed mushroom in the world. Very prominent in Asian cuisine, the shiitake mushroom has also become a staple in kitchens worldwide. Rightfully so, mushrooms, in general, are very versatile. But the shiitake is well-known for its smoky flavor and rich texture. The descriptor that you probably hear the most when it comes to shiitake mushrooms is “meaty.” Even our friends at The Castaway Kitchen shared the trick to cooking mushrooms: a good sear. You have to treat them like you would a good steak! “Shii,” translated in Japanese, refers to the tree on which these “take,” or mushroom, originally grew. In Japan, there are two types of shiitake mushrooms: donko (more round with a thick flesh) and koshin (thinner flesh and an open cap). 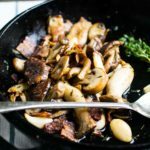 This mushroom bacon skillet recipe is simple, quick, and keto-friendly. It makes for a perfect weeknight meal and doesn’t require too much clean up, either. *Garlic confit is slow roasted garlic cloves submerged in oil. A great way to preserve garlic if you buy it in bulk, it’s also mighty delicious. Use avocado oil for a keto-friendly confit. are your nutrition values for the entire recipe or a portion of it? Hi Amy, the nutrition value is for the entire recipe. Hi Kim, this yields 1-2 servings cooked.